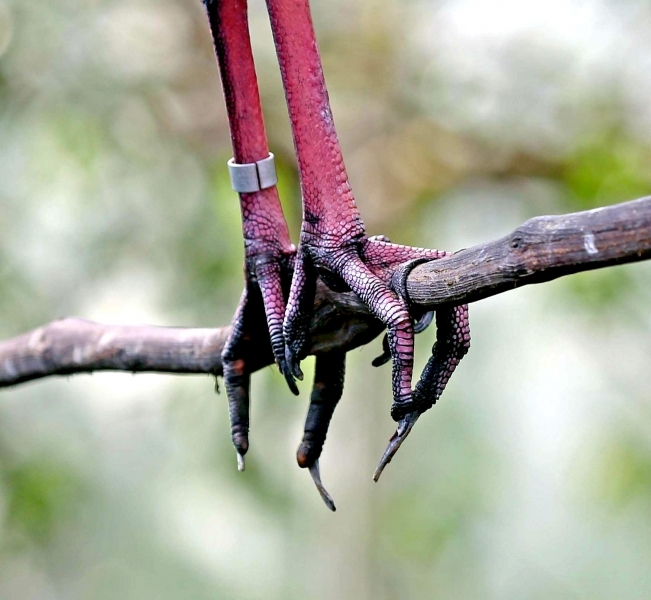 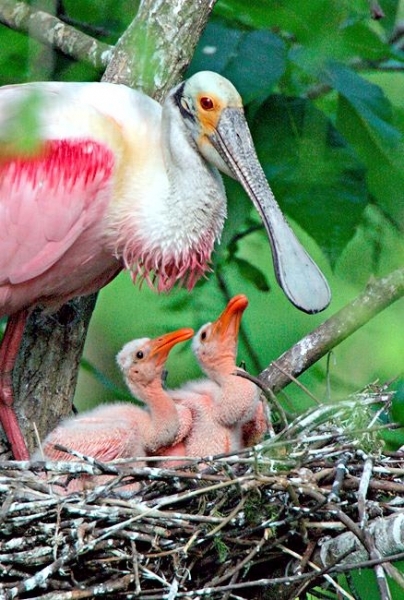 The most distinctive characteristic of the Roseate Spoonbill is its long spoon-shaped bill. 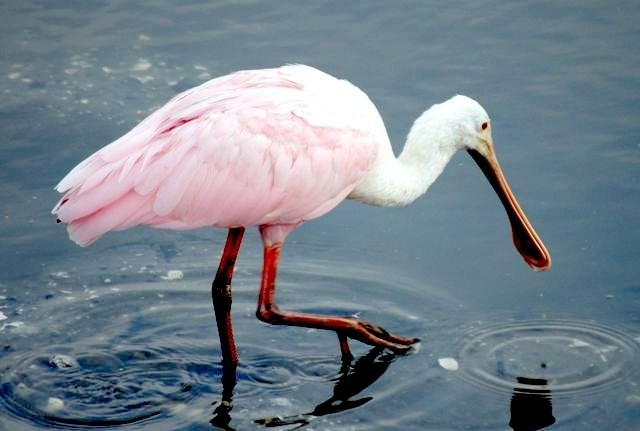 It has a white head & chest and light pink wings with a darker pink fringe and very long pink legs. 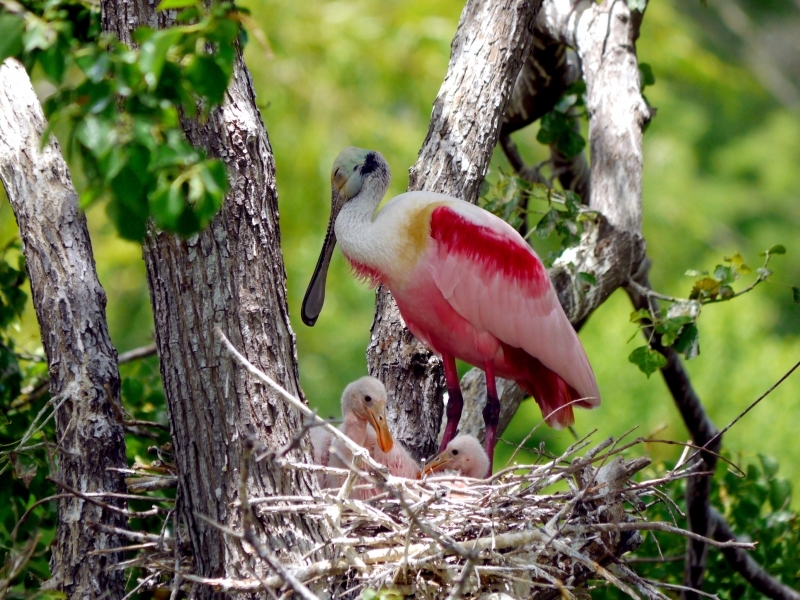 The Roseate Spoonbill is about 2.5 feet in length with a wingspan of about 4.5 feet. 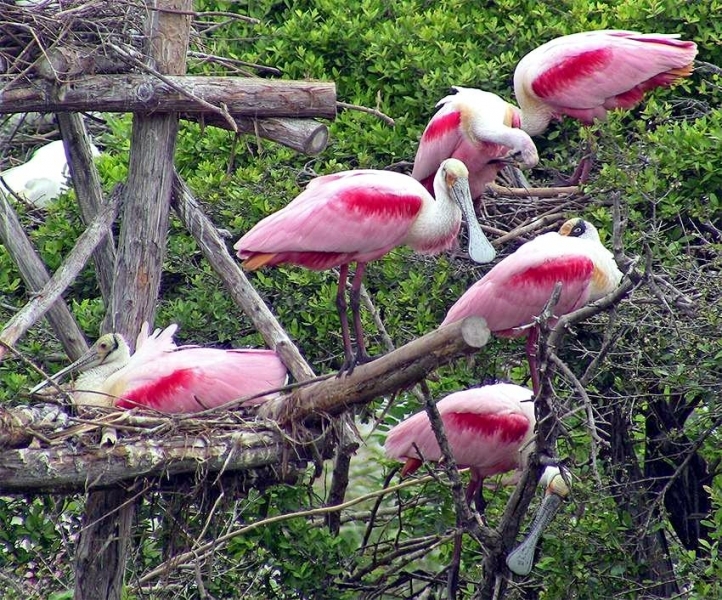 Both males & females have the same plumage & coloring. 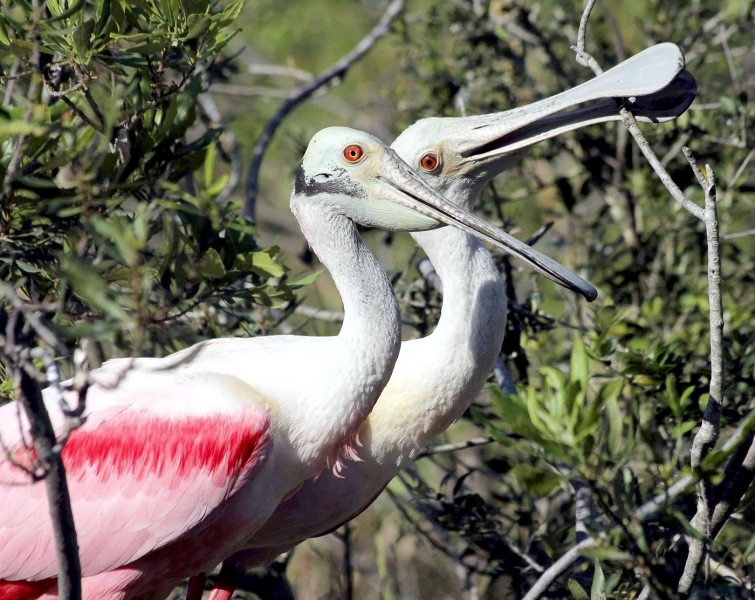 The male is slightly larger than the female and its bill is a little longer. 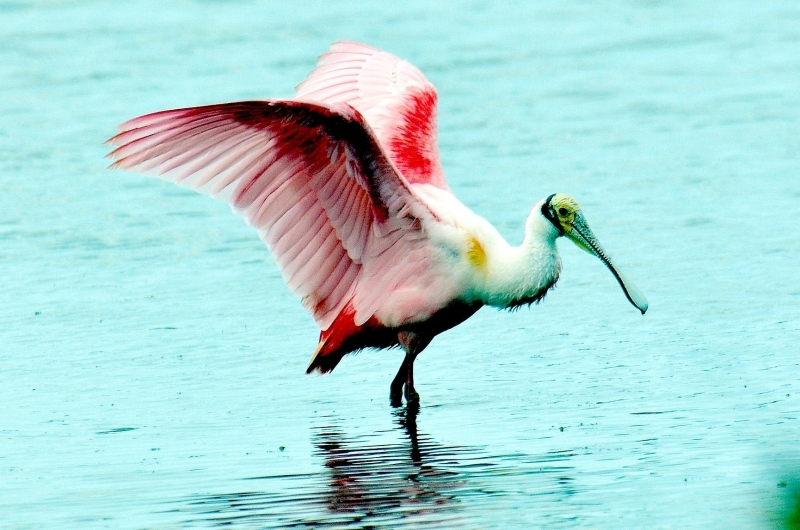 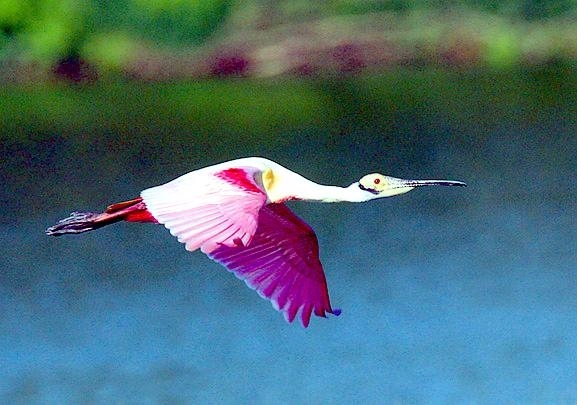 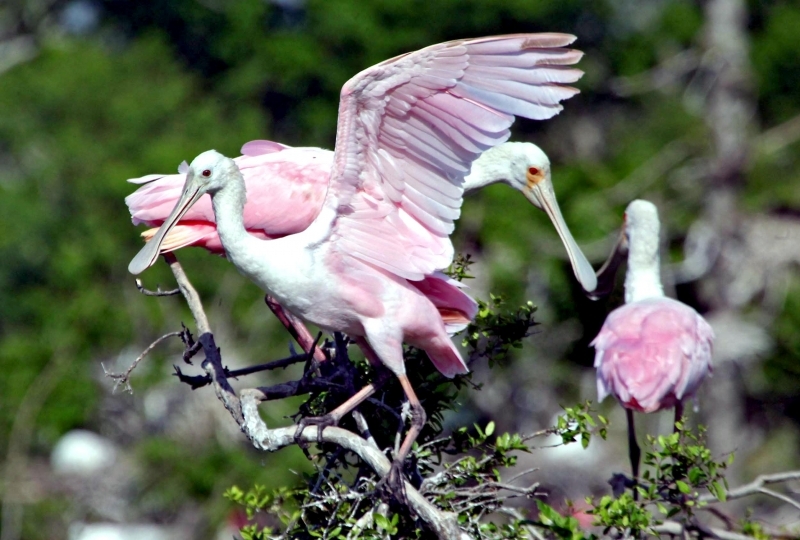 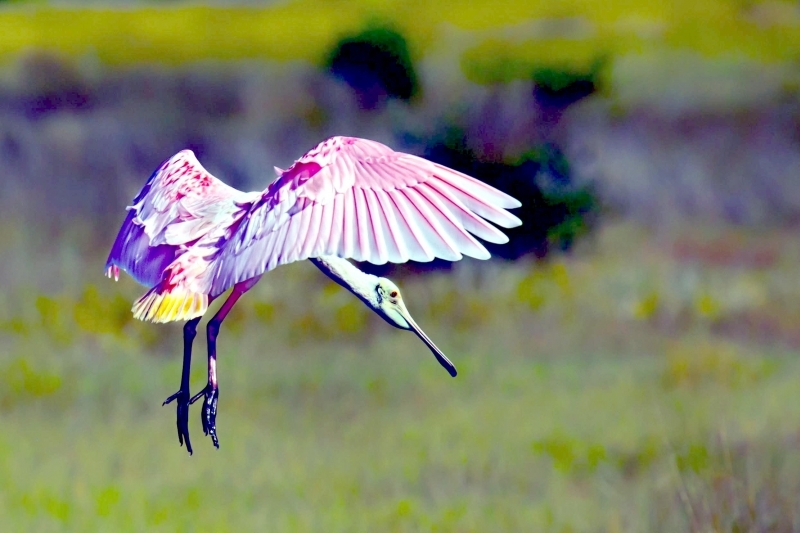 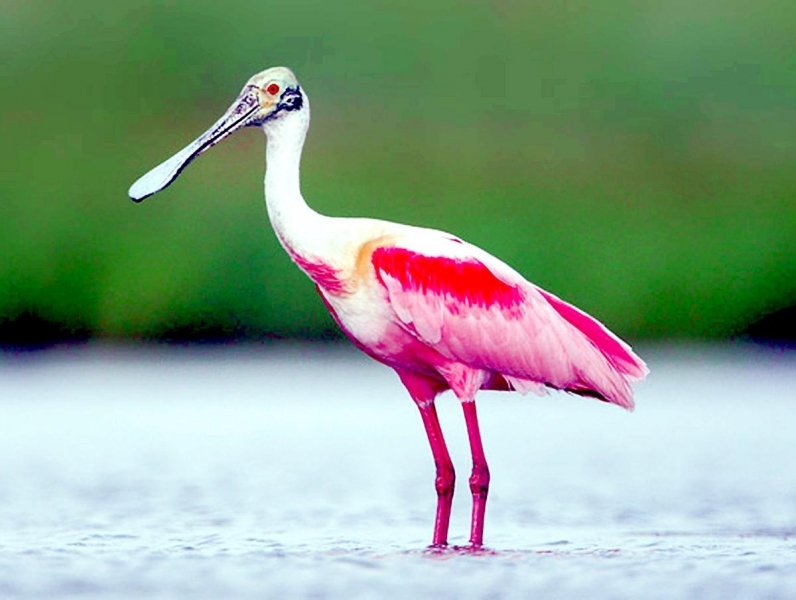 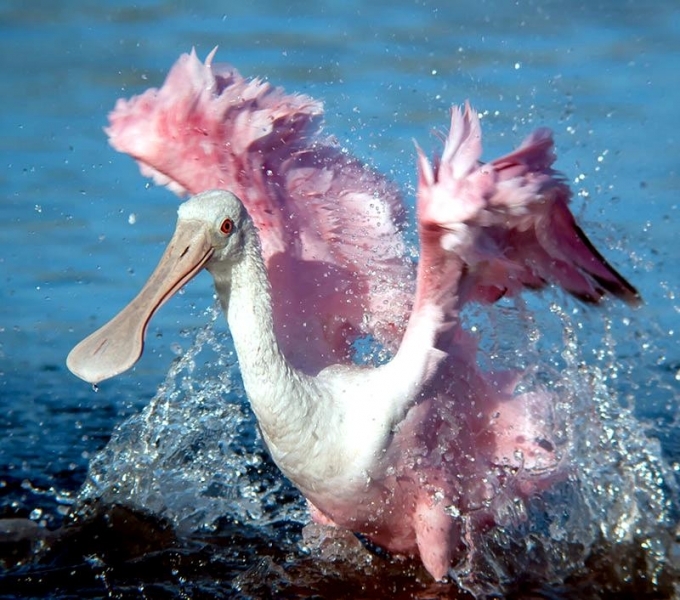 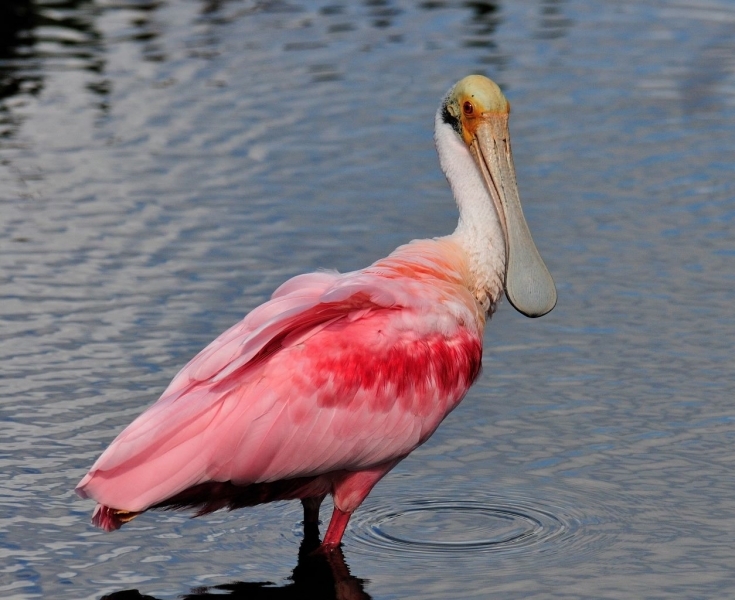 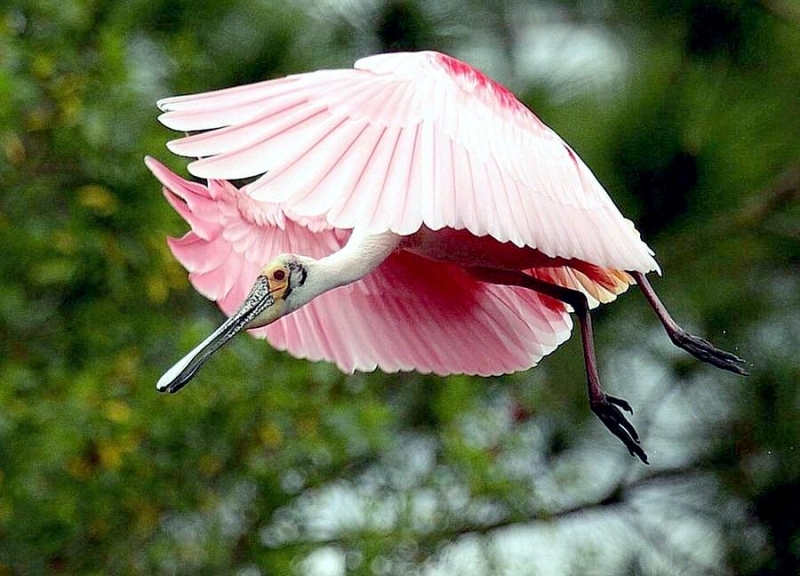 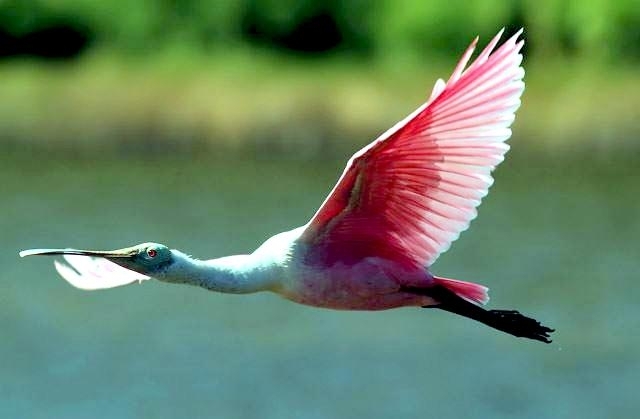 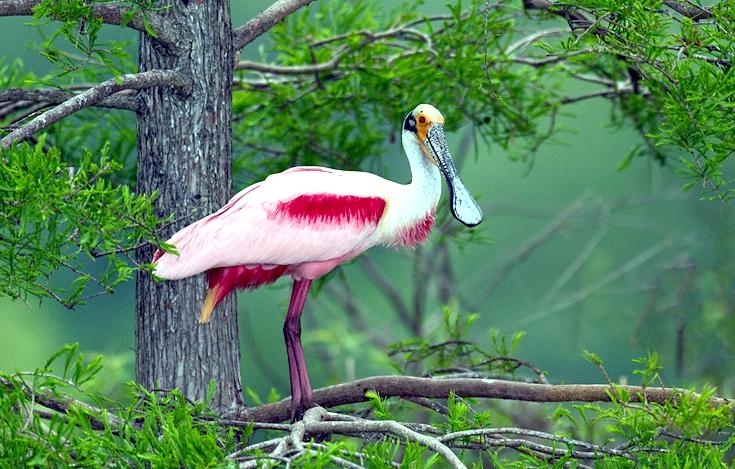 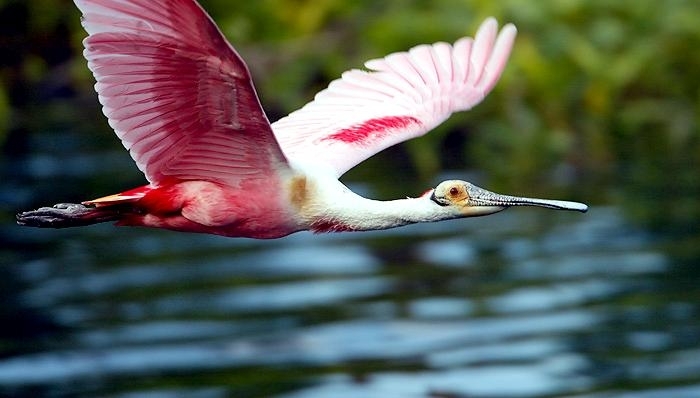 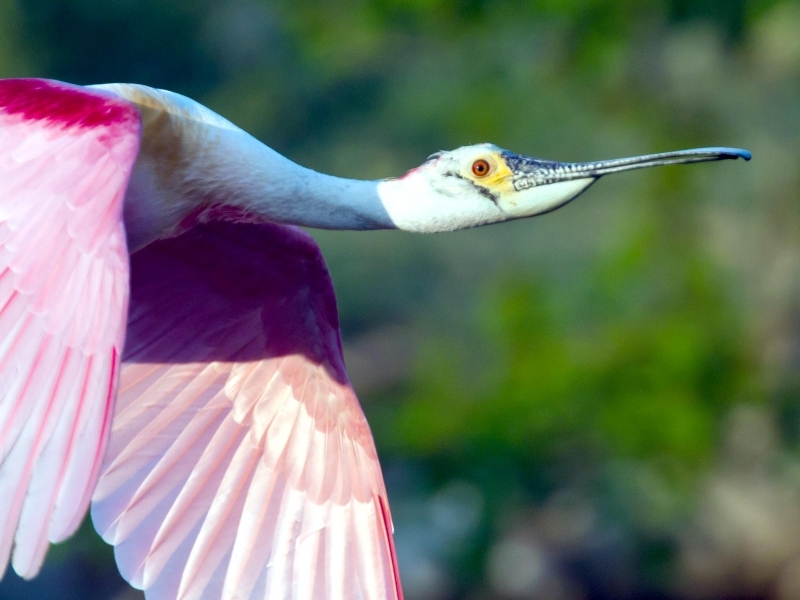 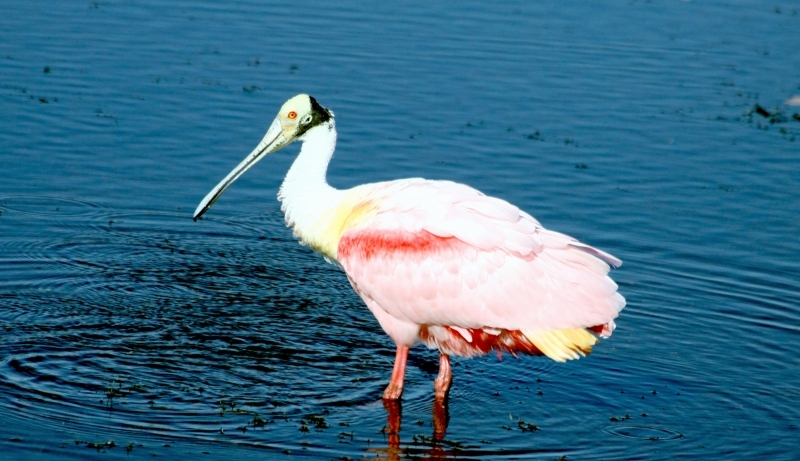 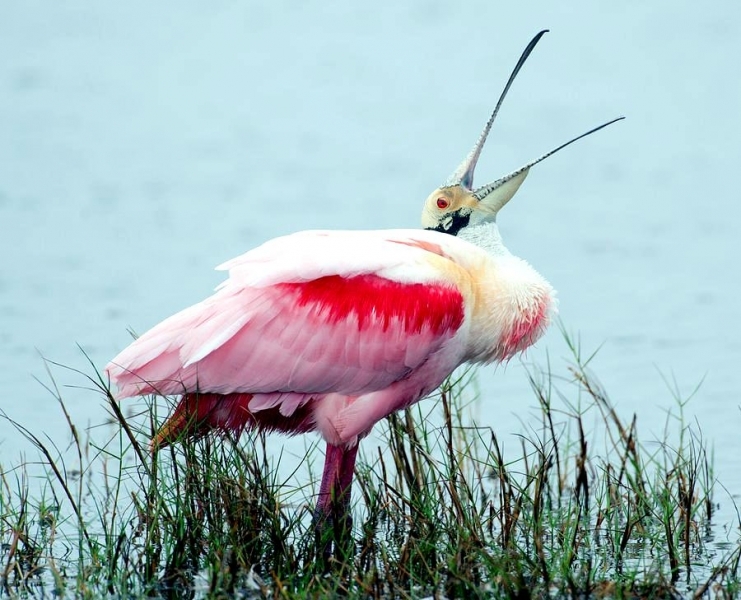 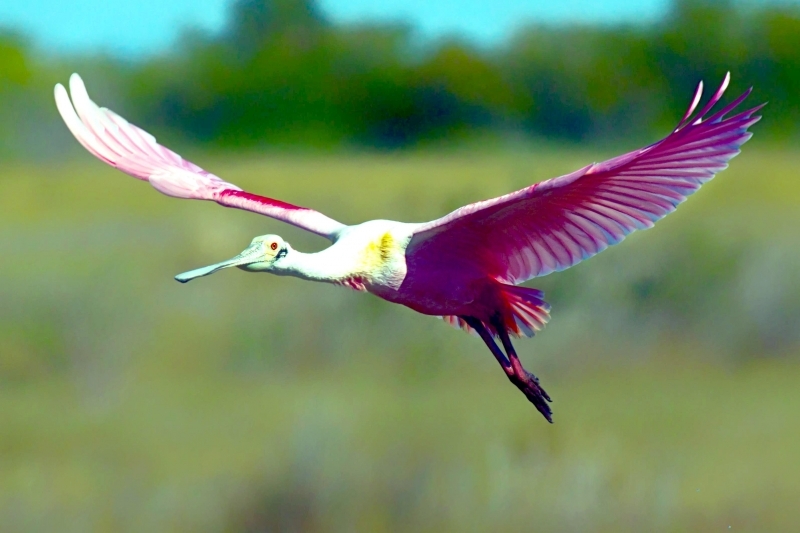 The Roseate Spoonbill can be found on the coasts of Texas, Louisiana and southern Florida. 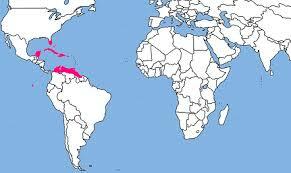 It is also found in Central & South America. 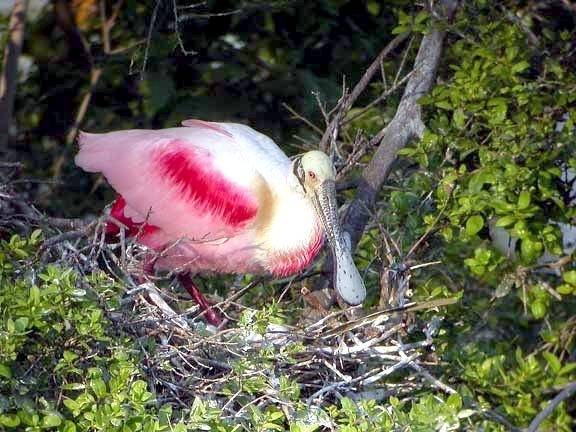 The Roseate Spoonbill lives in mangrove swamps, tidal ponds, saltwater lagoons and other areas with brackish water. 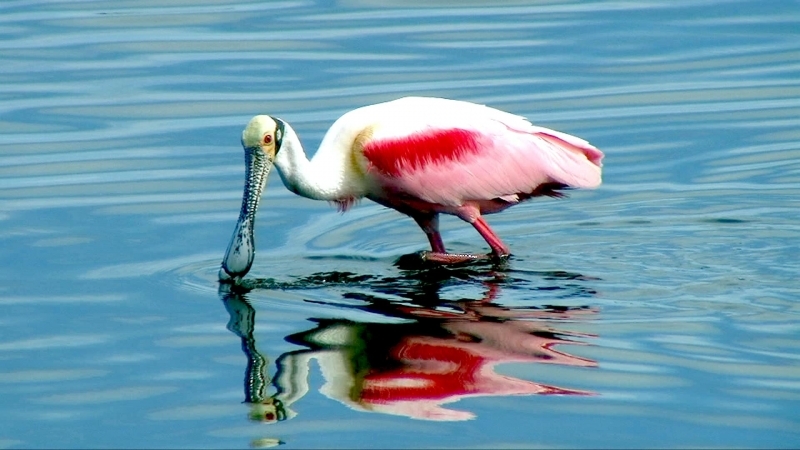 The Roseate Spoonbill spends a lot of its time in shallow water feeding. 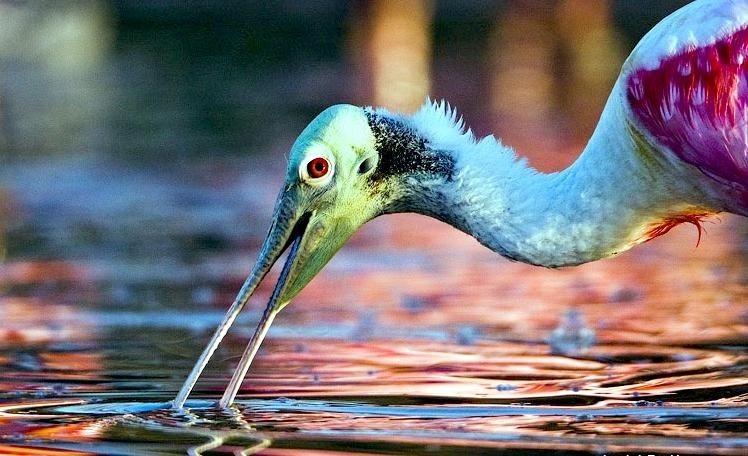 It sweeps its open bill from side to side in the water to sift up food like small fish, shrimp, mollusks, snails and insects. 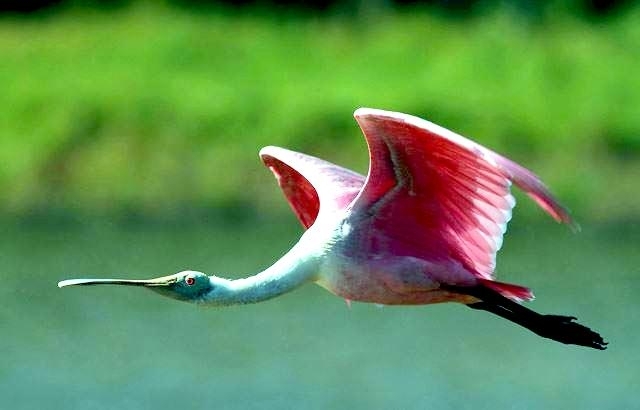 It has touch receptors in its bill that help it feel its prey. 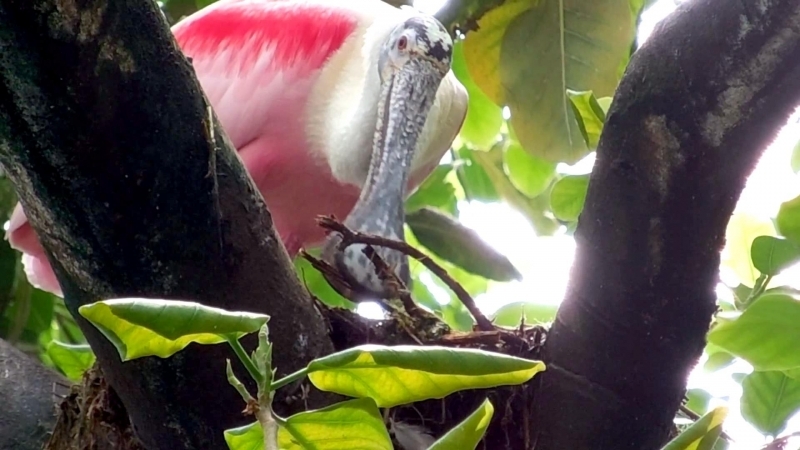 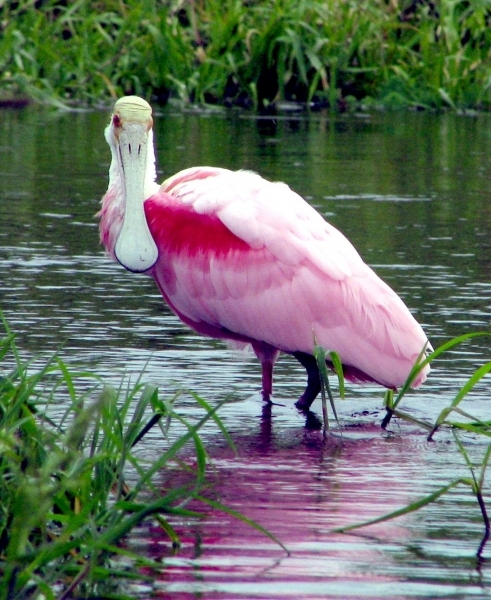 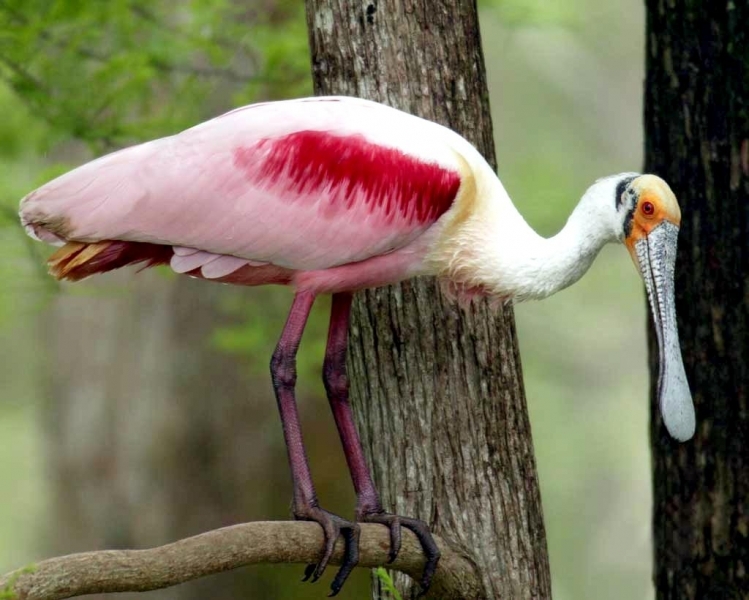 Like the Flamingo, the Roseate Spoonbill’s pink color comes from the food it eats. 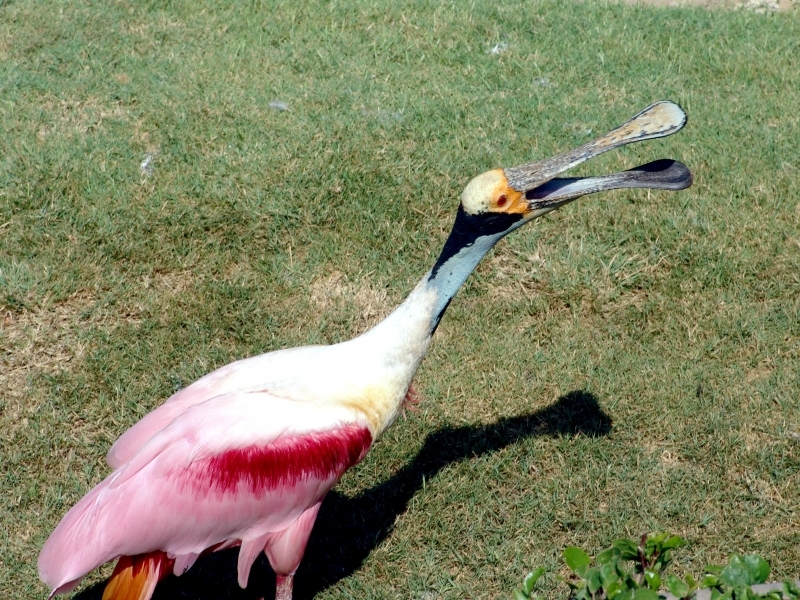 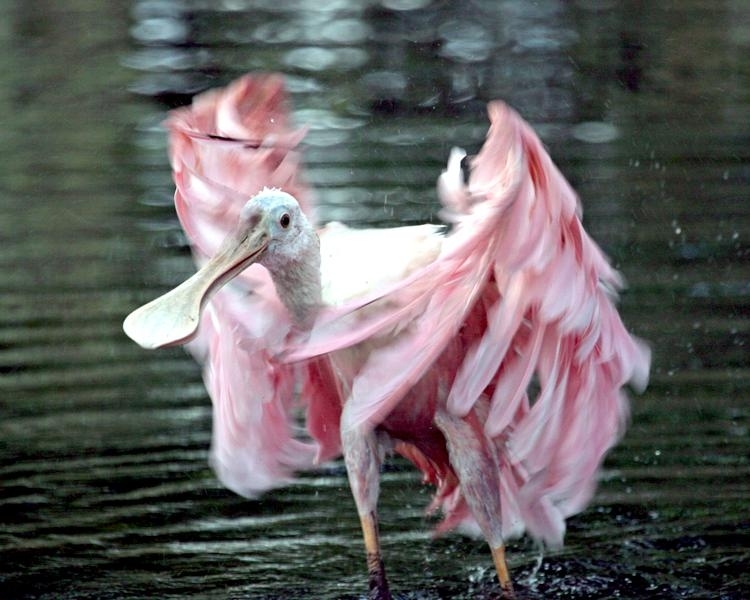 Some of the crustaceans it eats feed on algae that give the Roseate Spoonbill’s feathers their rosy pink color. 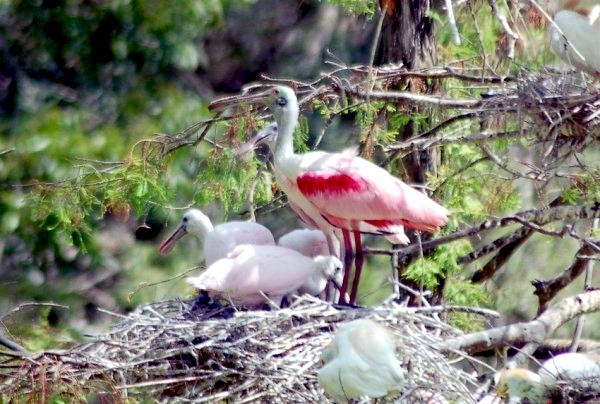 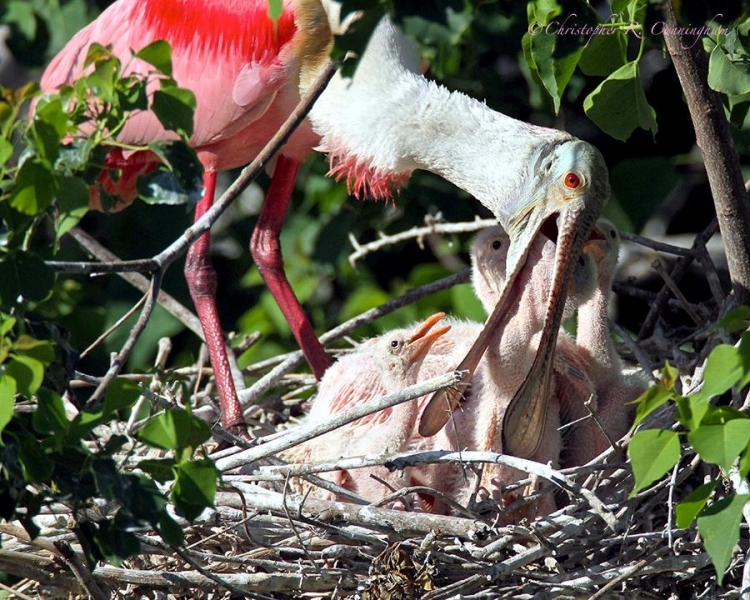 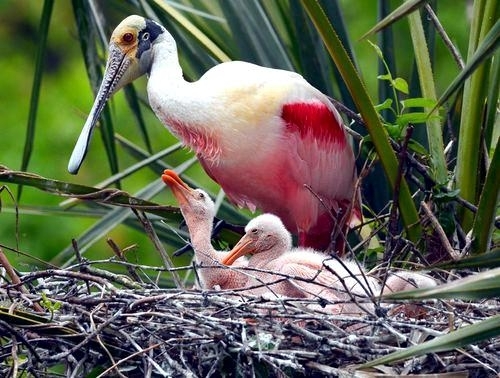 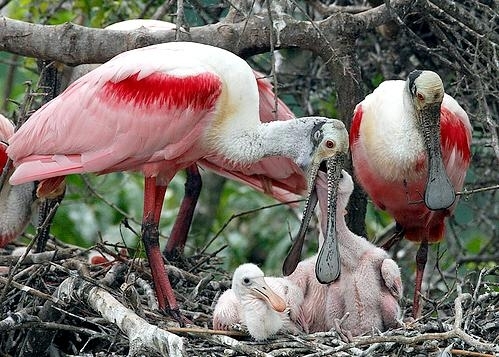 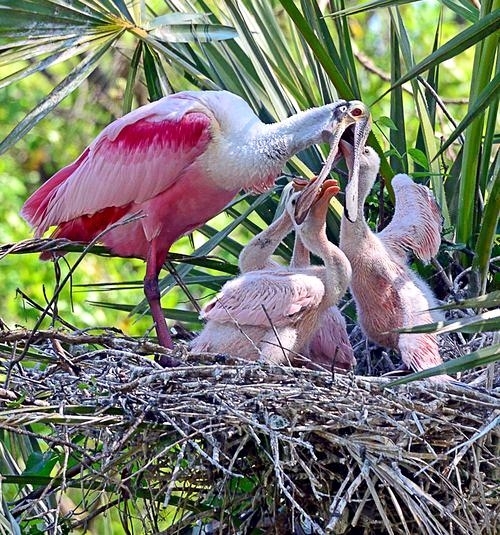 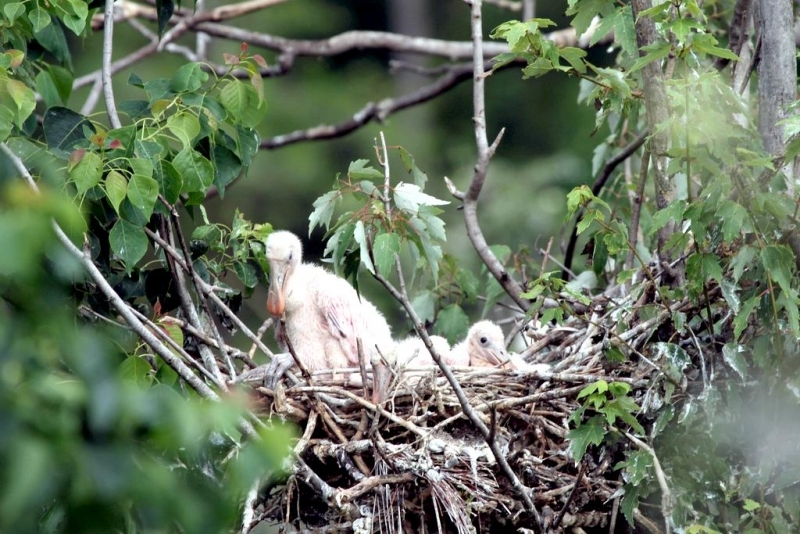 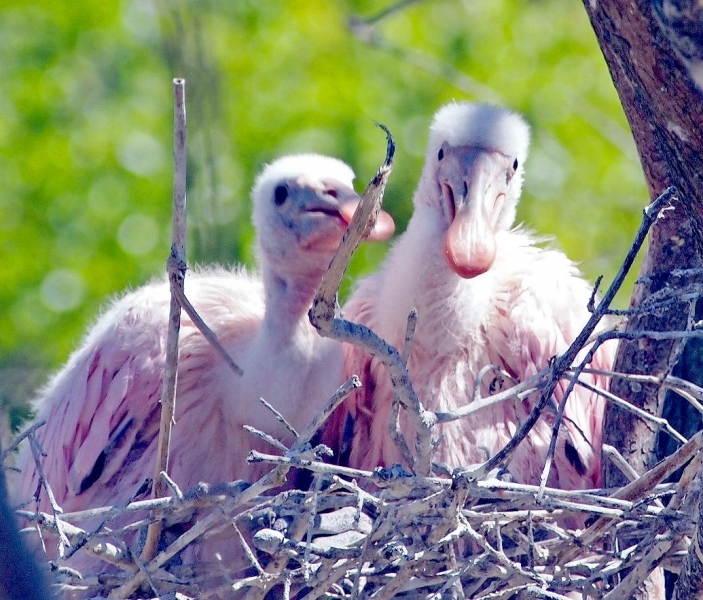 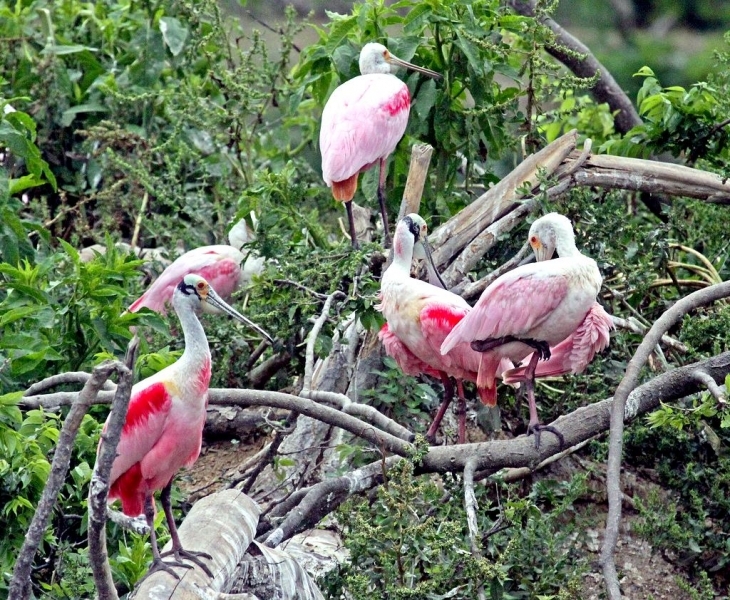 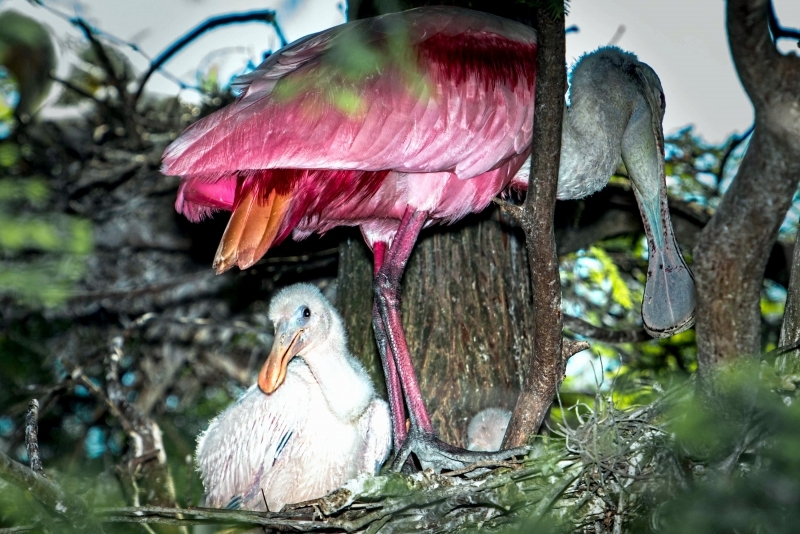 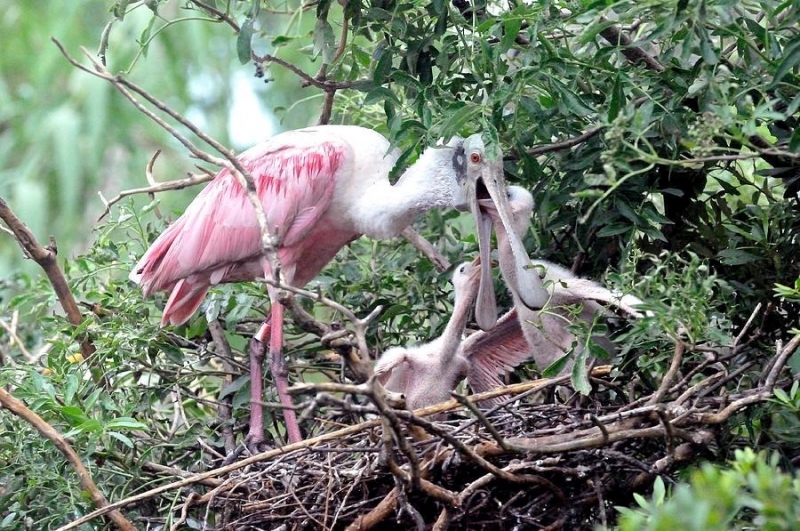 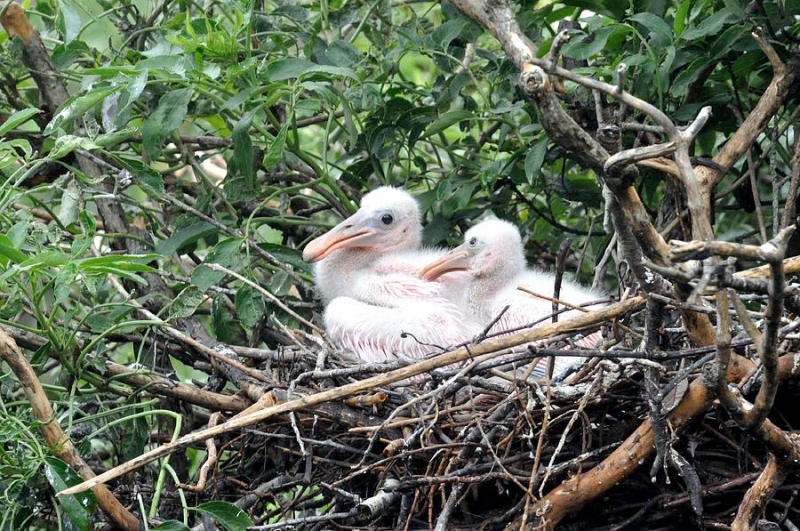 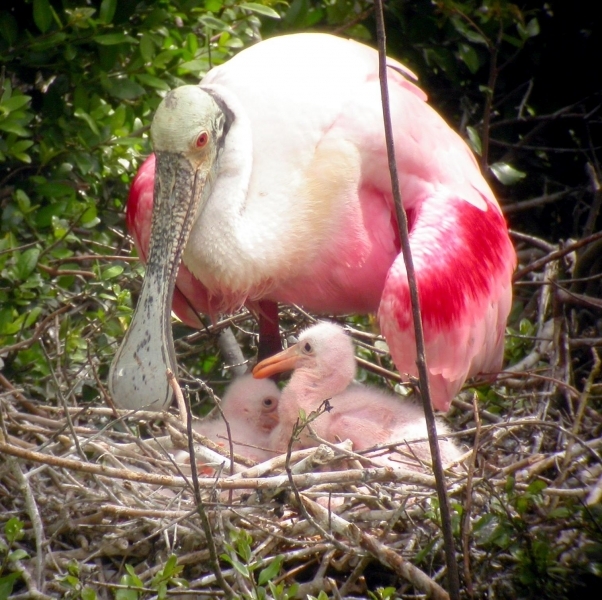 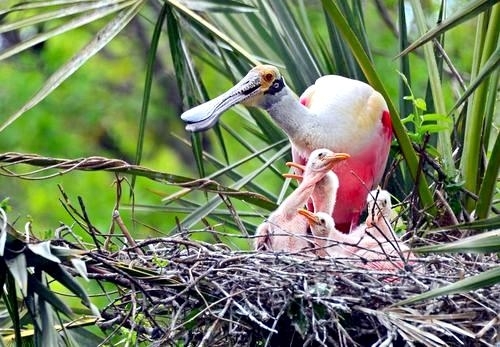 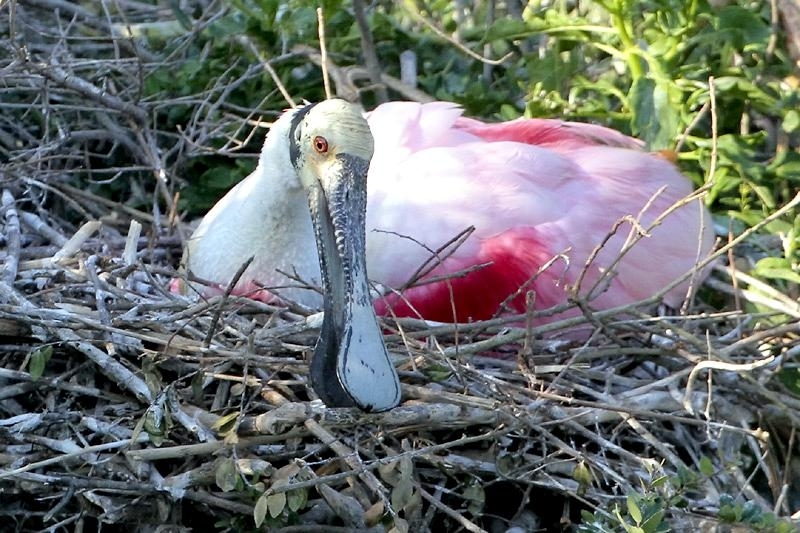 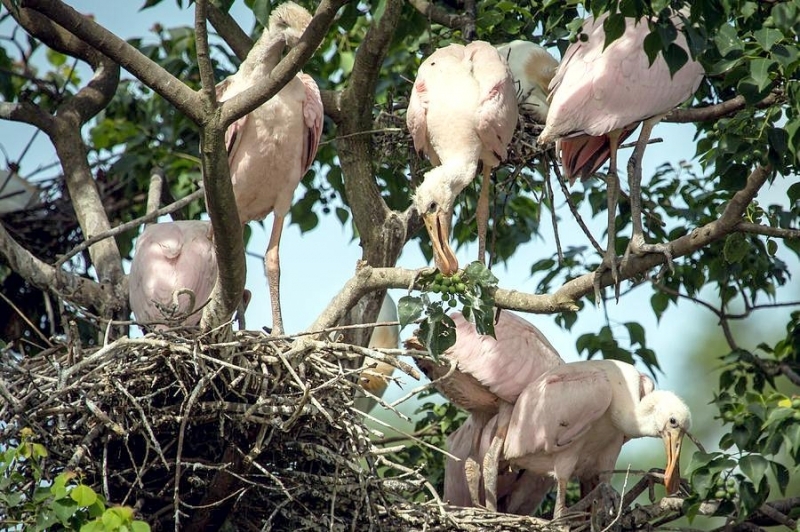 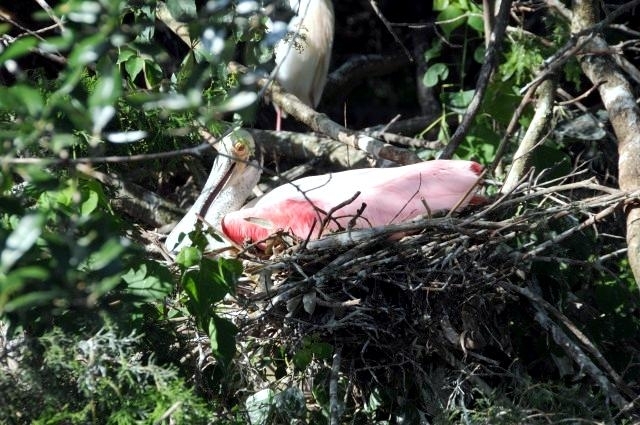 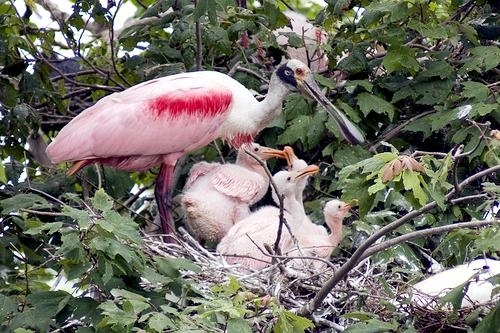 The Roseate Spoonbill nests in colonies. 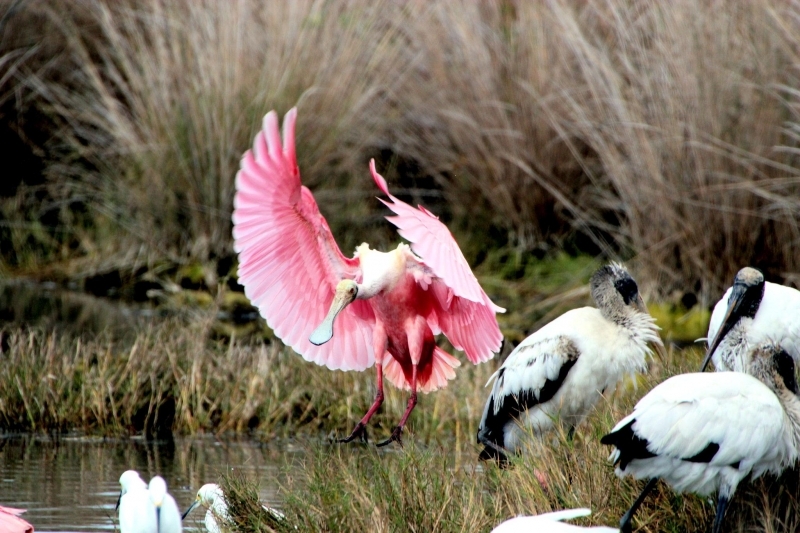 Males & females pair off for the breeding season and build a nest together. 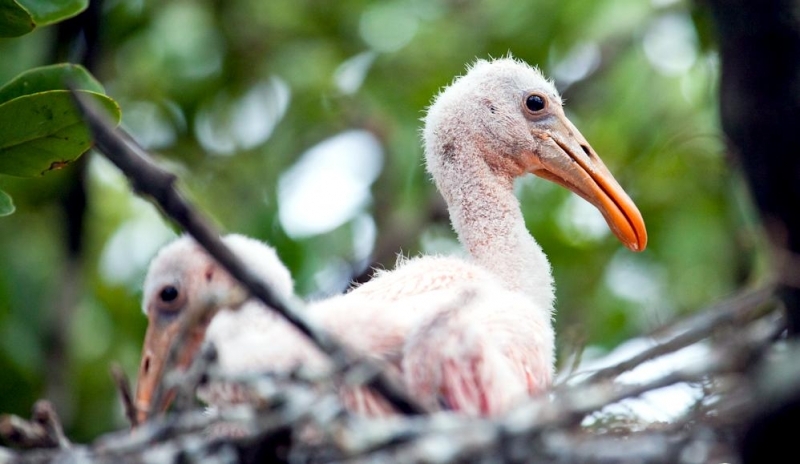 They build large nests of sticks lined with grass & leaves. 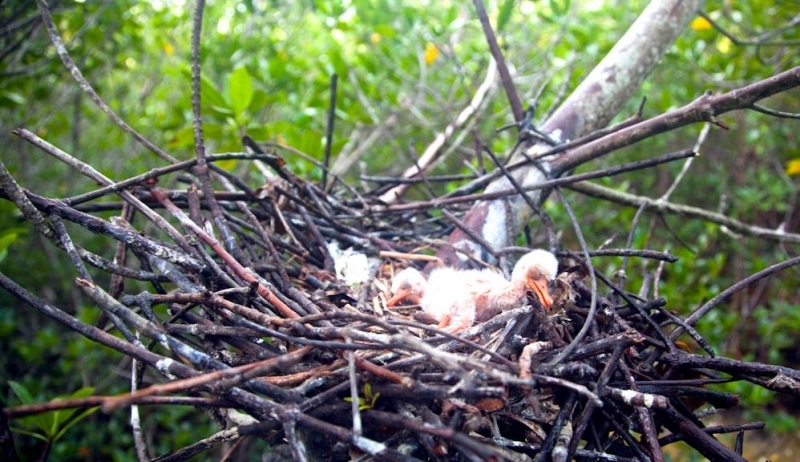 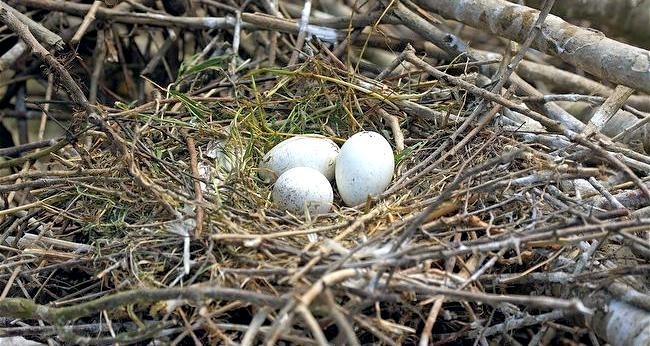 The nests are built in trees. 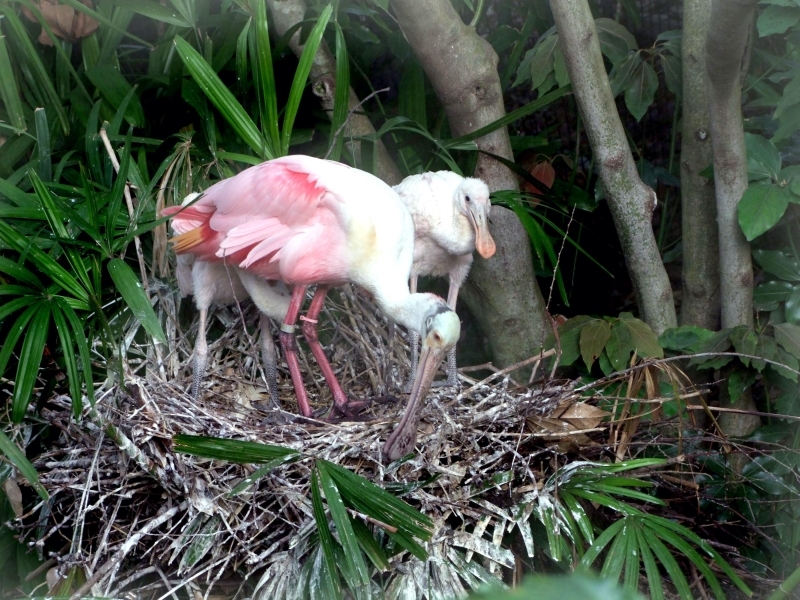 The female Spoonbill lays 2 to 4 eggs. 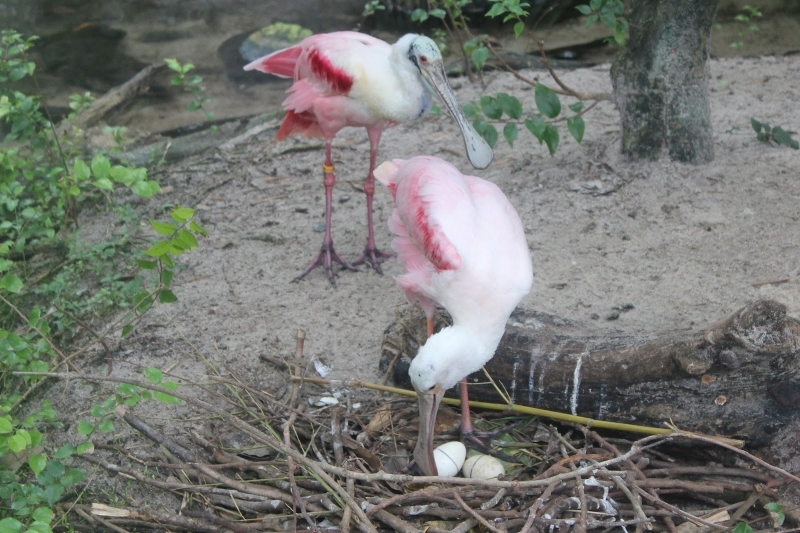 Both the female & male incubate the eggs. 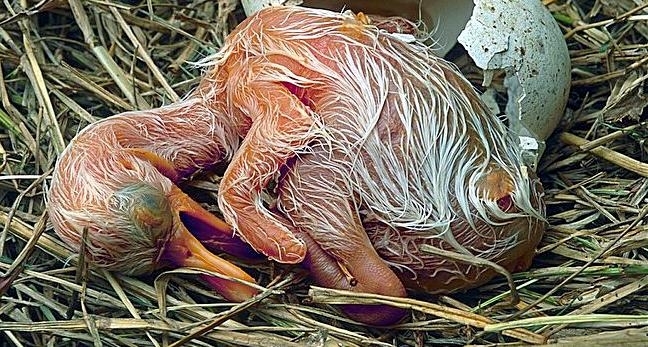 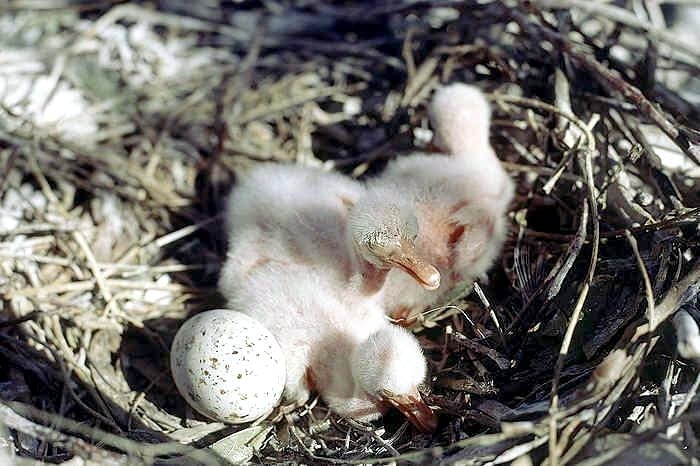 The chicks hatch in about 3 weeks and fledge in around 35 to 42 days. 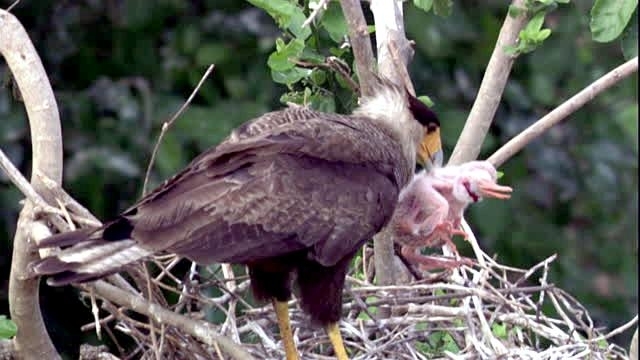 Both the male & female feed the chicks until they are about 8 weeks old. 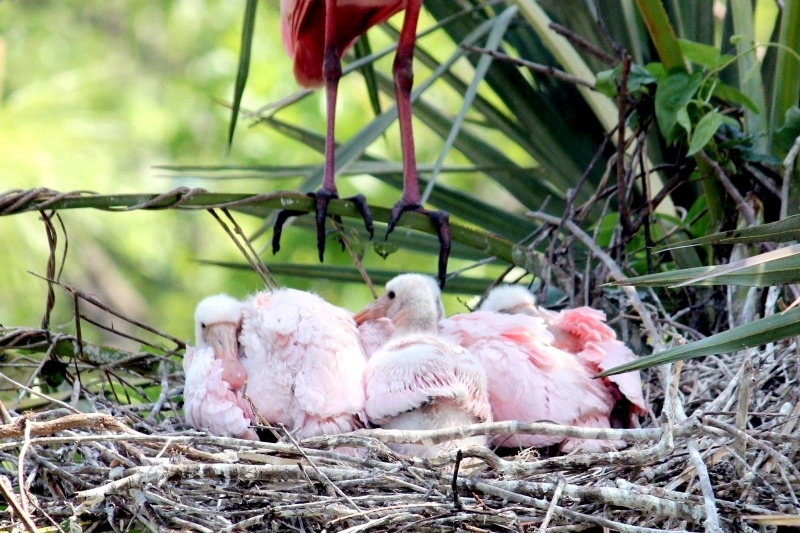 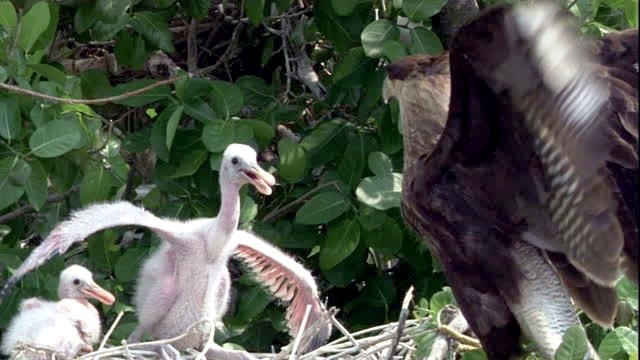 Young Roseate Spoonbills have white feathers with a slight pink tinge on the wings. 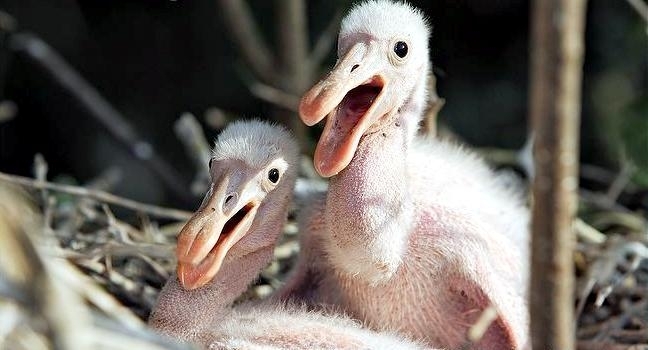 They don’t reach maturity until they are 3 years old. 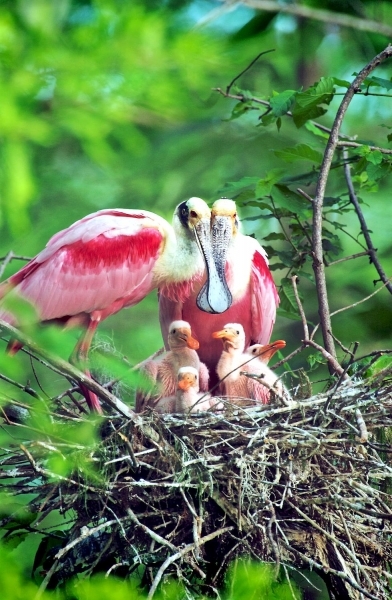 Roseate Spoonbills are very social. 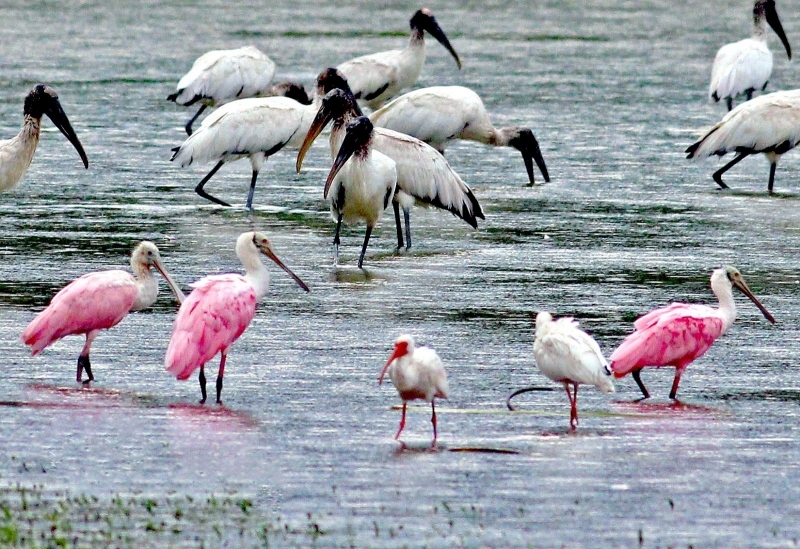 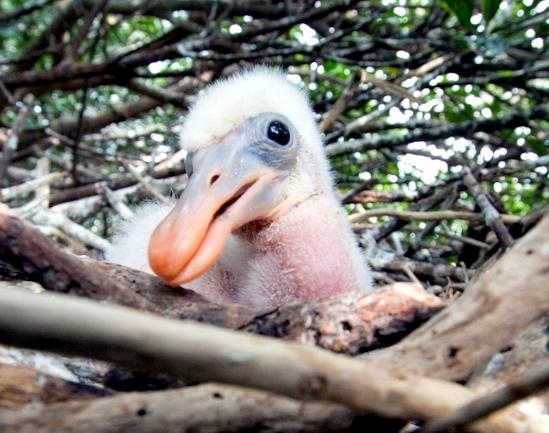 They live in large colonies with other spoonbills, ibises, storks, herons, egrets and cormorants. 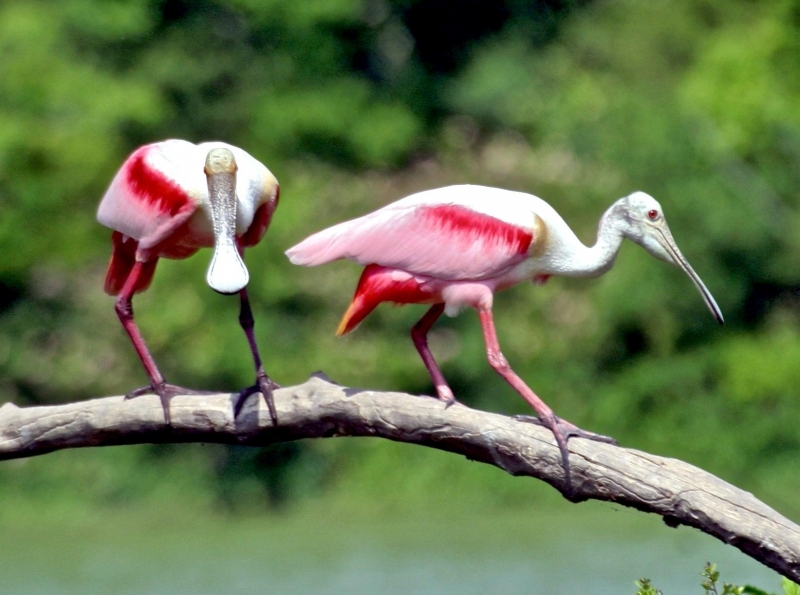 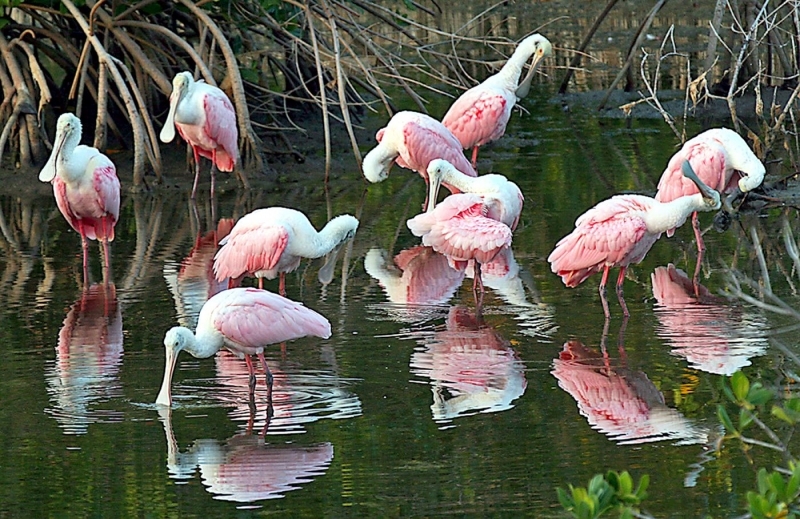 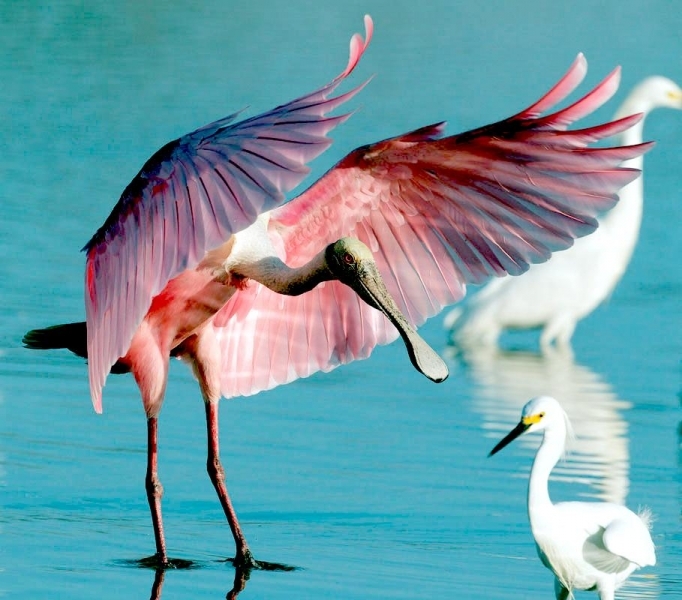 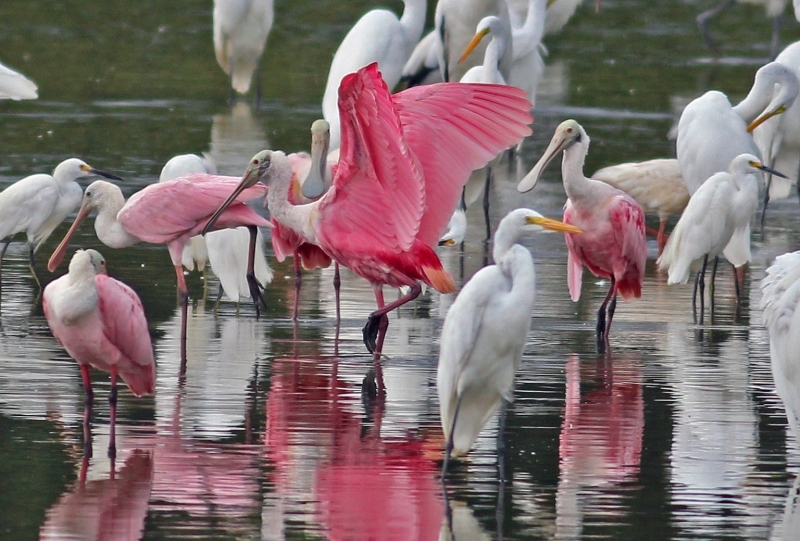 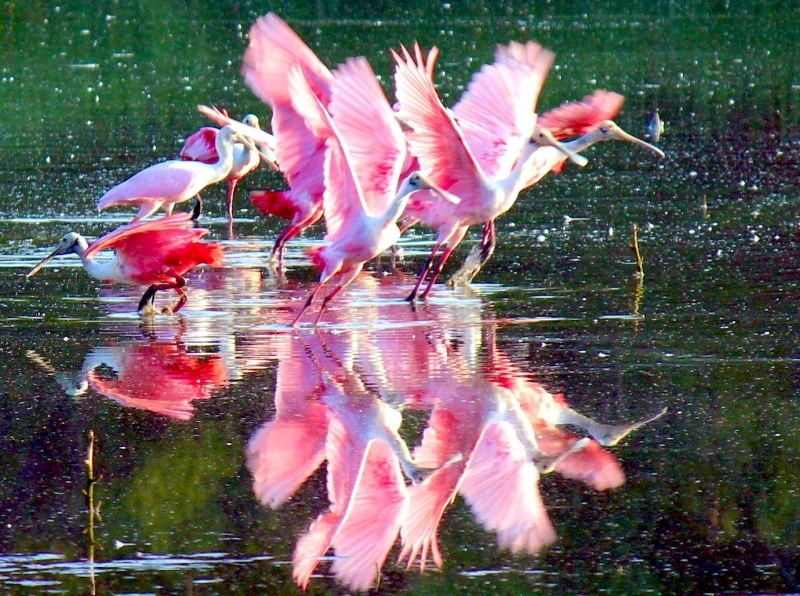 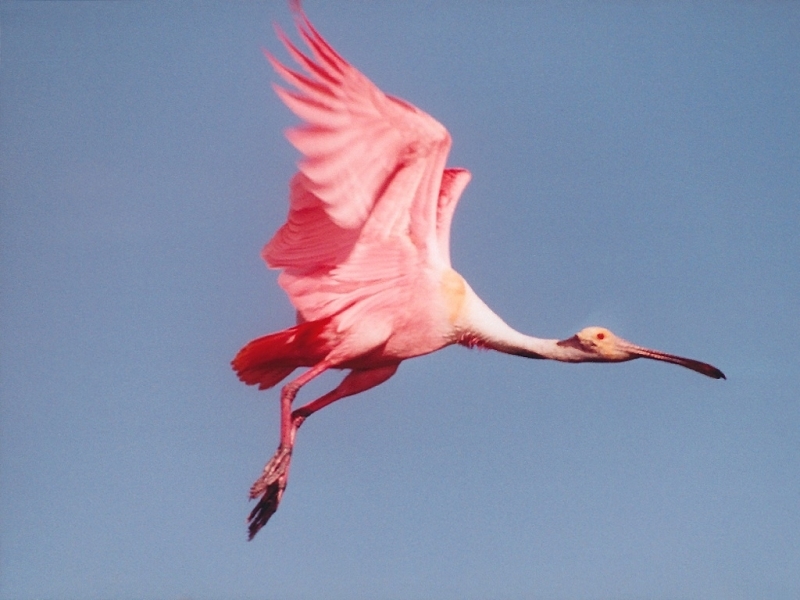 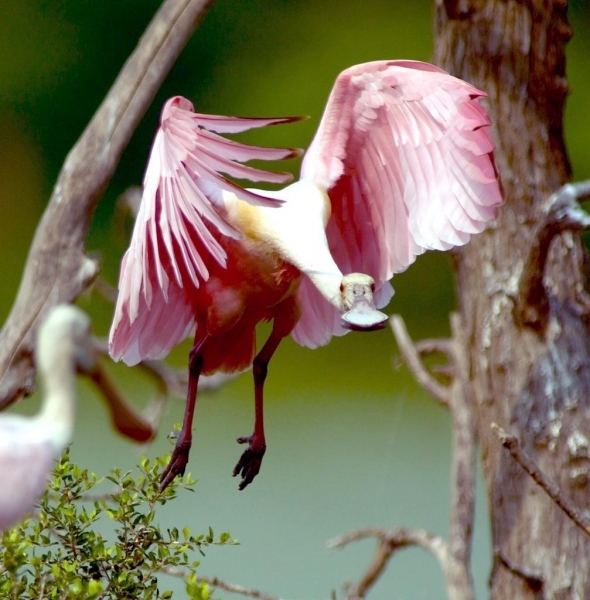 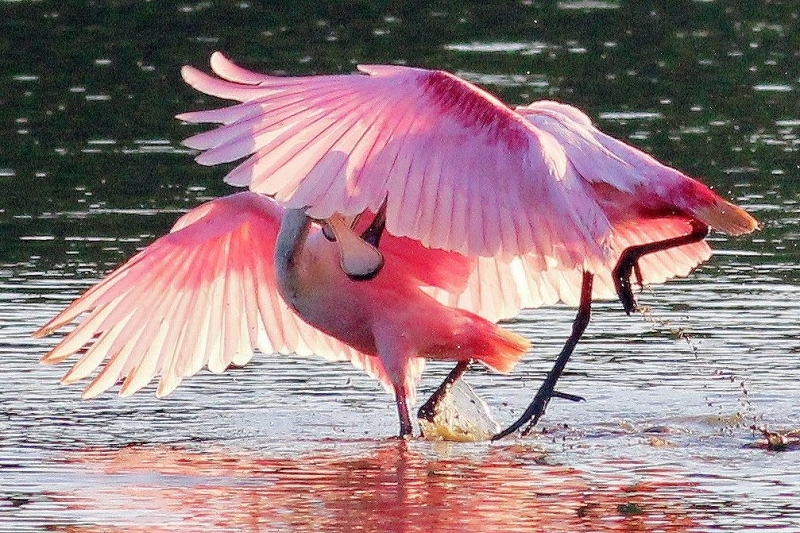 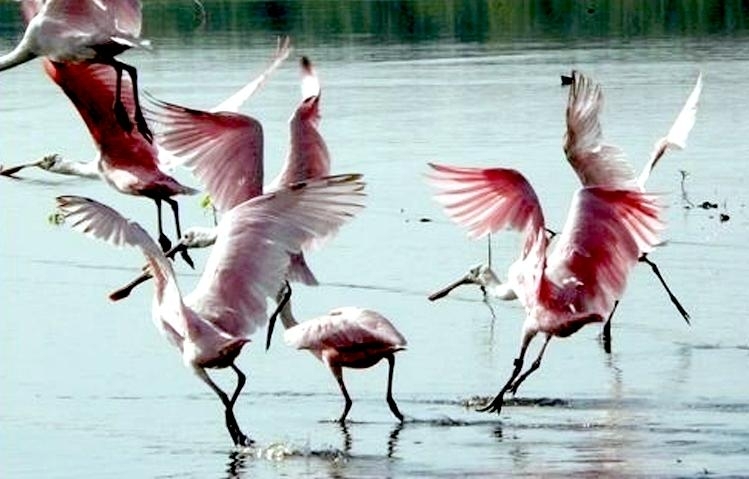 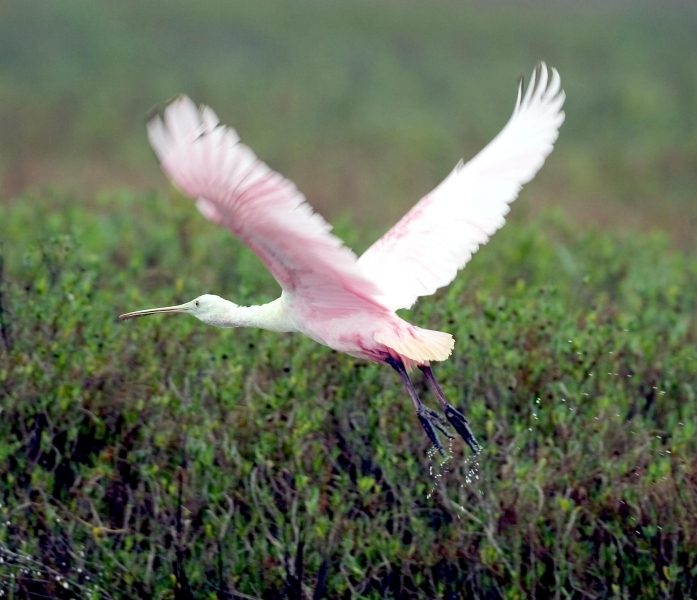 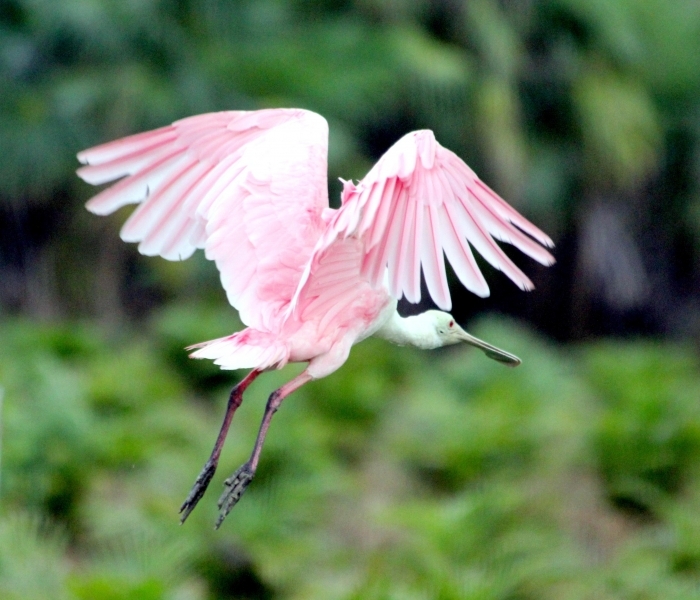 Roseate Spoonbills fly in flocks in long diagonal lines with their legs & neck stretched out. 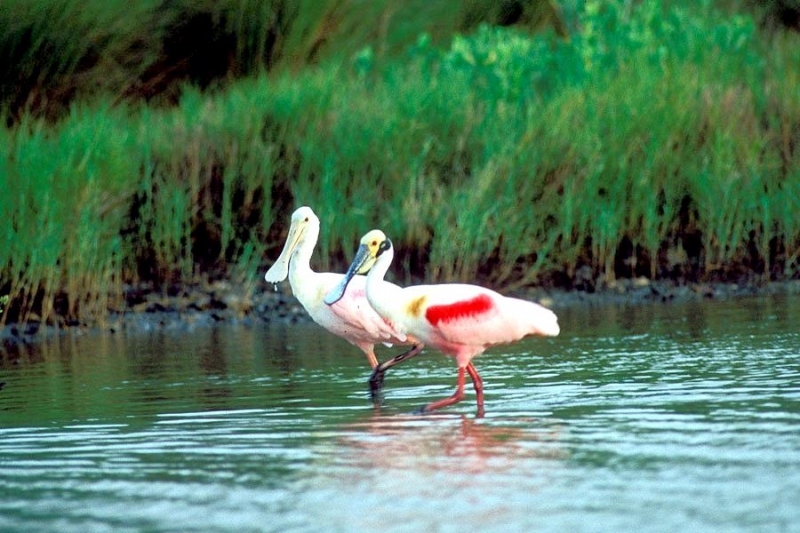 The Roseate Spoonbill population was once threatened by hunting. 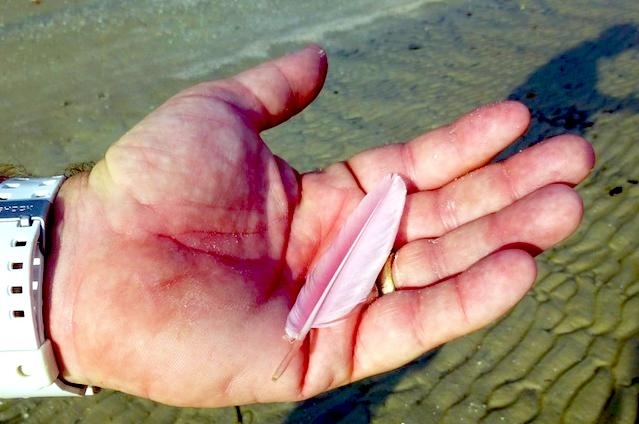 In the mid-to-late 1800’s, its feathers were used in lady’s hats & fans. 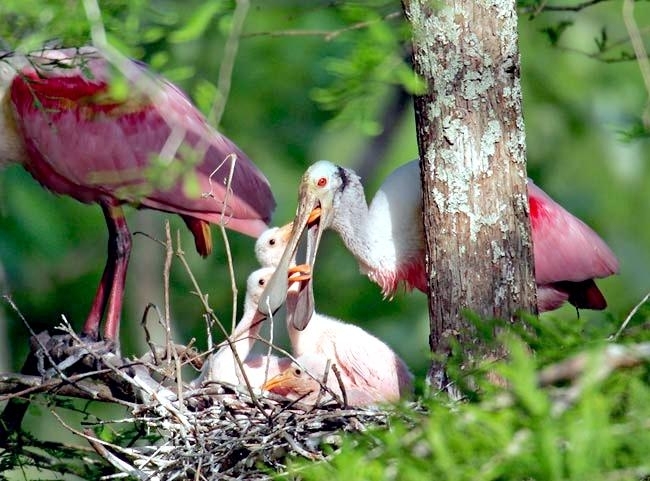 The population was also threatened by loss of habitat due to drainage & pollution in its habitat. 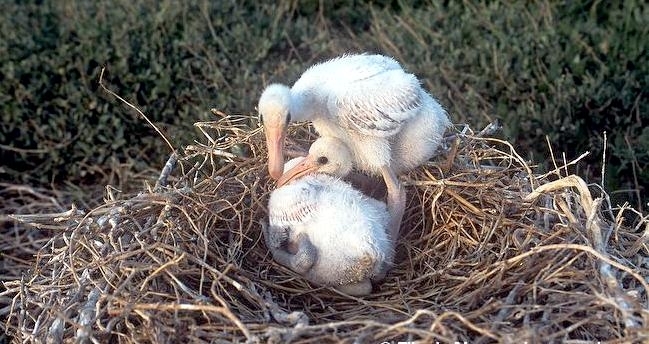 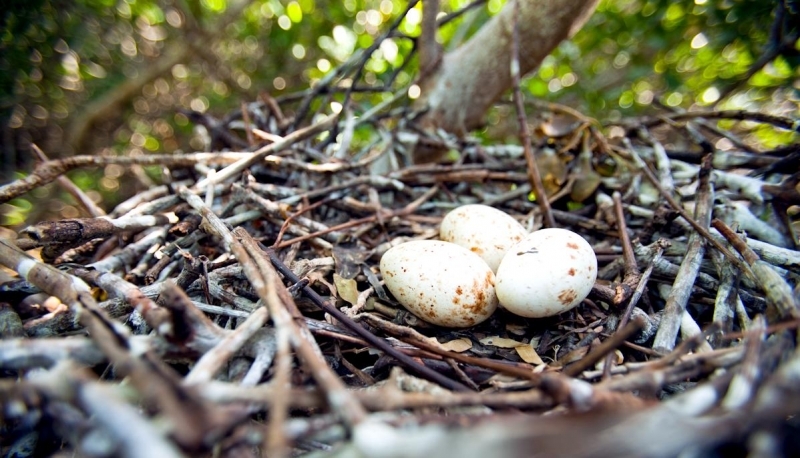 By the early 20th century, the population had shrunk to only a few dozen nesting pairs in the United States. 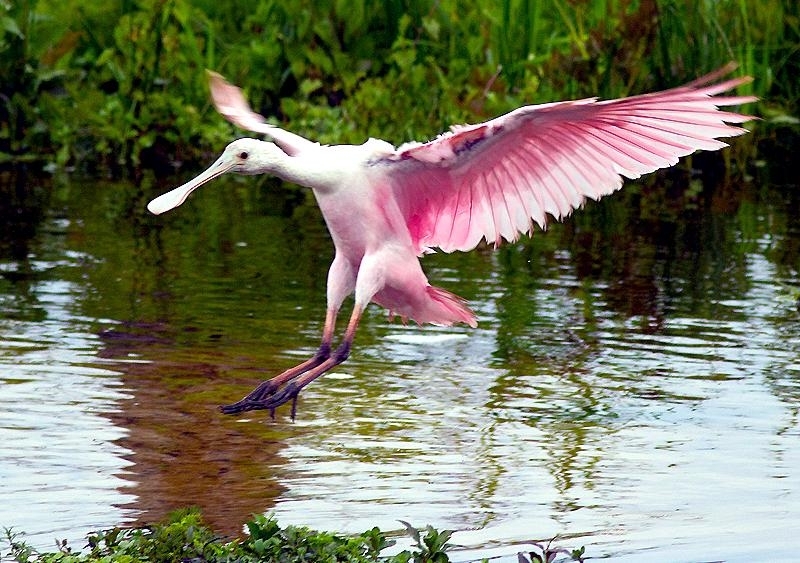 Special protected areas were set aside for them and in the 1940’s, they were made a protected species. 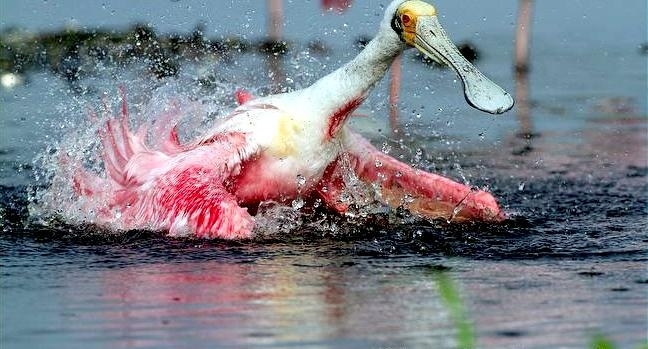 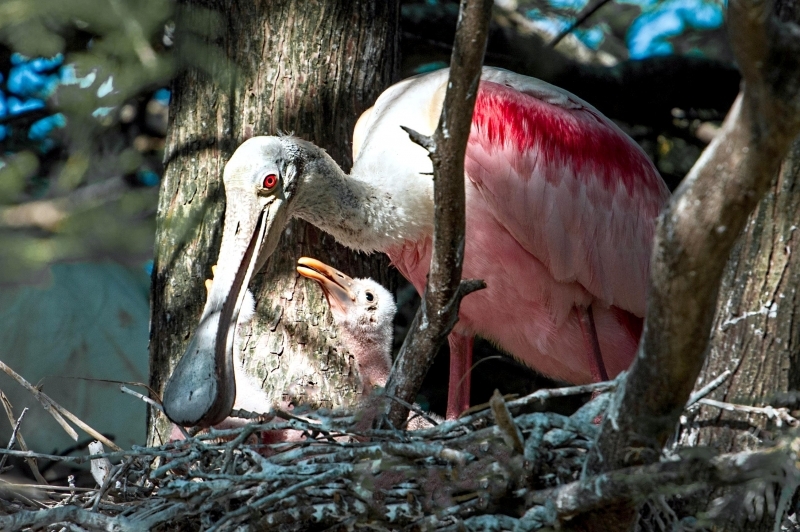 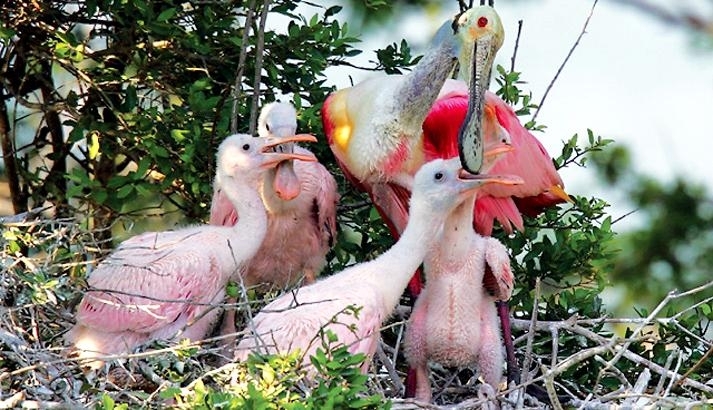 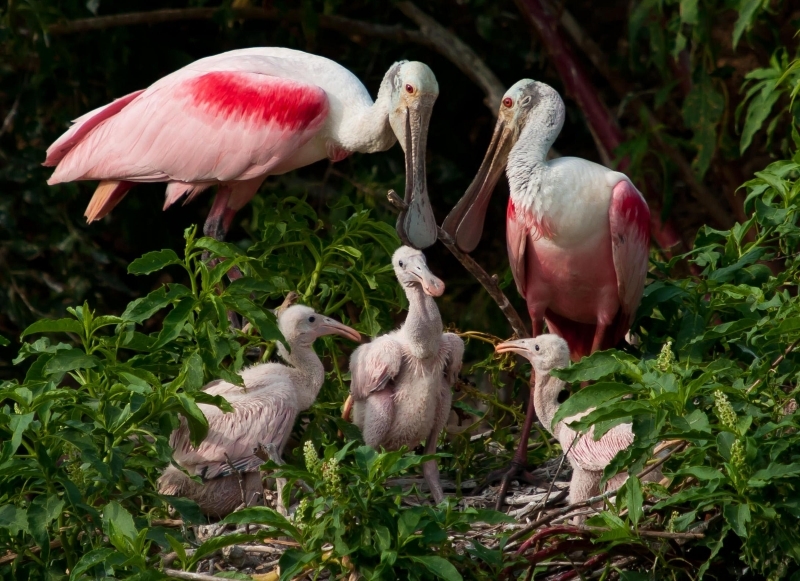 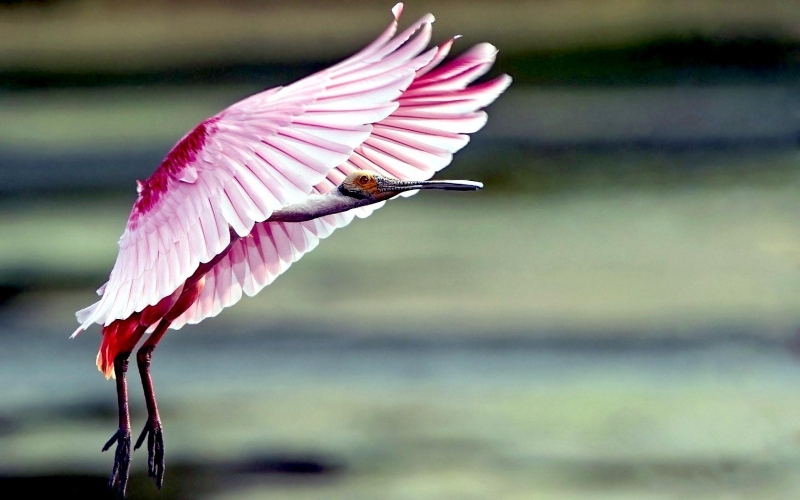 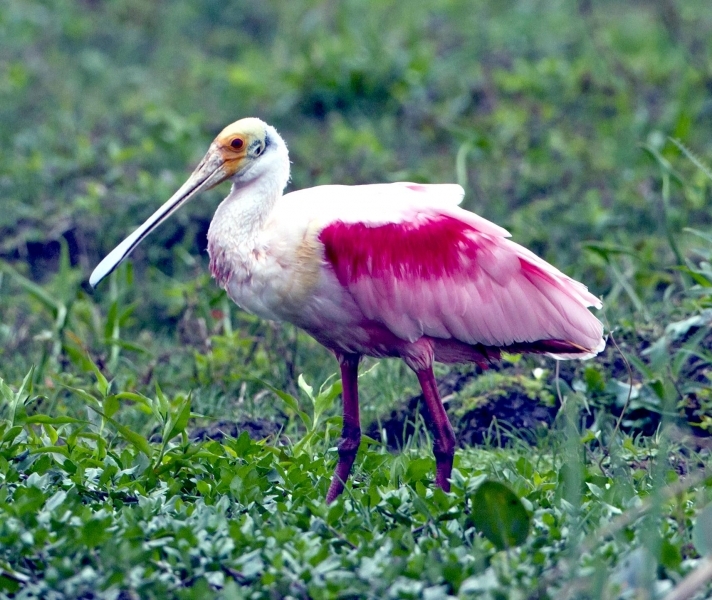 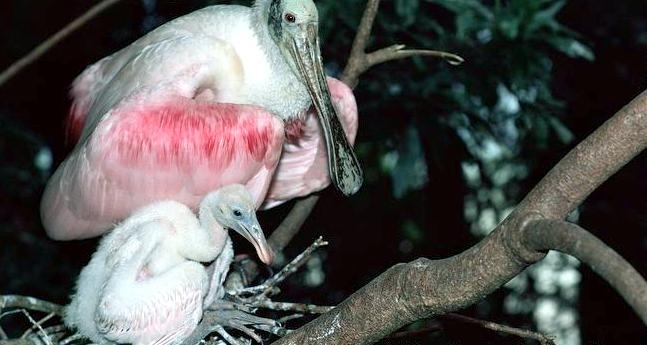 Over time the population recovered and today, the Roseate Spoonbill is no longer a protected species. 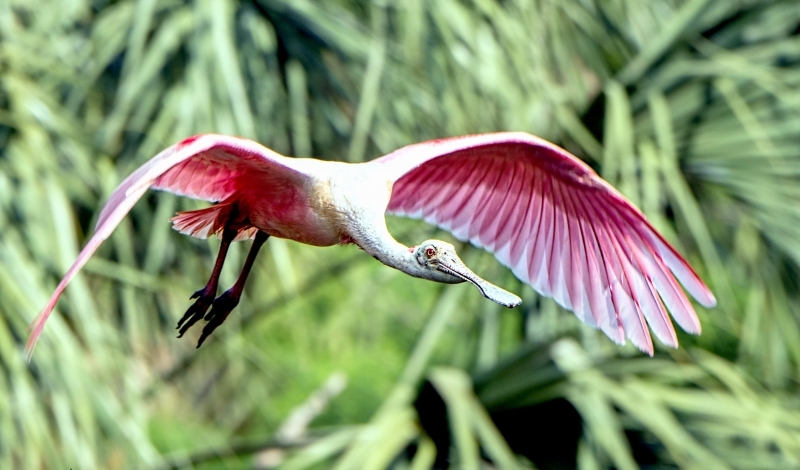 Despite it’s very distinctive appearance, the Roseate Spoonbill is often mistaken for other birds like the Flamingo, particularly when in flight, even though they are generally smaller in size and have a longer, wider beak. 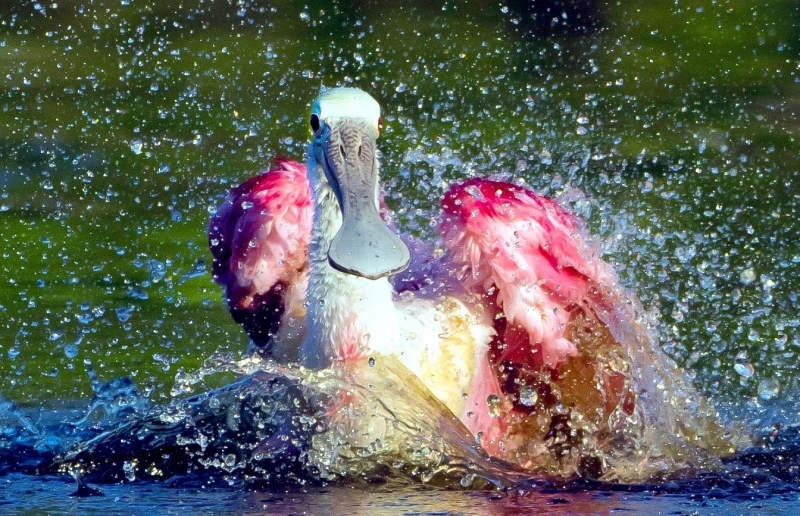 Not only is their distinctive spoon-like bill useful for catching food though, but there are also very sensitive nerves at the end, which causes the Roseate Spoonbill’s beak to snap shut quickly when it comes into contact with small aquatic organisms.